In autumn 1991 the Riga Latvian Society still had unstable situation; existed even two Societies. However, despite the conditions, Youth and children commission’s leader Arnolds Skride established concert cycle – contest „Talent for Latvia” that was devoted to the Latvian music schools’ students, and which in 2011 celebrated its 20th season. 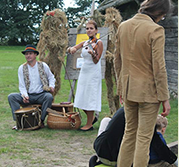 The idea was supported by Latvian Children Fund and its chairman Andris Bērziņš. In the first concert on November 24, 1991 in the RLS Gold Hall the concert gave Jūrmala’s and Jāzeps Mediņš music school’s students, but the first season’s final concert, which was shown on TV, took place on May 30, 1992. At the beginning of the 90s in Latvia were 90 music schools, where learned more than 1200 children. Amongst them, once in a while, appeared brilliant talents, whom have to be given the opportunity to prove themselves by performing in the capital city. These obstacles then led to the concert cycle’s – contest’s coming into exstence. During the contest from November to May, at the beginning once a month, the concert gave two music schools (one from Riga and one from the province) that was held in the Riga Latvian Society’s Gold Hall. After each concert the jury called those students, who were moved forward to the finale, where the pupils could compete for the places and Latvian Children Fund’s prizes. During first years performed 10-12 music schools, but, thanks to the growing popularity of the contest, the number reached 20 and more per season. The number of winners also rose. If, in the first season there were 14 laureates, in the last 19th season there were 51 students. For many concert cycle’s – contest’s „Talent for Latvia” laureates it was the first step to success in future, already more prestigious international contests, as well as the impulse to choose musician’s career. It is hard to mention all of them, so there are only some of the winners: pianists Lauma Skride, Reinis Zariņš, Artūrs Cingujevs, Rūdolfs Vanks, etc., violinists Vineta Sareika, Liene Veija, Gerda Gabrāne, etc., cellists Marta Sudraba, Guna Āboltiņa, Maksims Beitāns, Mārcis Kuplais, etc., kokle players Anda Zabarovska, Līga Ančevska, etc., flute players Iveta Lāriņa, Zīle Ūdre, Rūta Īzaka, etc., clarinettists Egils Šēfers, Guntis Kuzma, Juris Ļipuncovs, Jēkabs Nīmanis, etc., percussion instruments’ players Rihards Zaļupe, Mārtiņš Miļevskis, etc., and many, many others. Many of them continue also the pegagogical work, and, during last seasons, we have listened performances of their students. Similarly, I would like to mention the constant jury members and profesors Valdis Kalniņš and Māris Villerušs, who have been with us all these years, many thanks I say also to the Latvian Children Fund’s chairman Andris Bērziņš for his support during all these seasons. In light memory we will keep Arnolds Skride, who went away on December 22, 2010.